Holy Cow Captain America Rocks! Think I’m talking about the recently released trailer for Captain America: The Winter Soldier?! Well you are only partially right! I’m also talking about a fantastic issue of the Uncanny Avengers that I picked up last night. In it Captain America is basically comic relief but holy cow did it work for the typically no nonsense stalwart defender of freedom! In it he is deafened by none other than a reanimated Banshee, formerly of the X-Men. So as you can imagine he can’t understand the pitch of his voice and yells a lot of things he means to say quietly. The best moment comes when he means to whisper to Havok that the Wasp has a crush on him but instead yells, “I think she likes you”, embarrassing everyone in ear shot. Not only that but the issue really seemed to flow and usher the plot forward after a couple of slower paced issues. I mean Uncanny Avengers is too good to be only a monthly title! I need more!!! I was initially dismayed that Casaday left the book so quick but I think his covers are so awesome I’ve now come to peace with it. Not to mention that Daniel Acuna is doing a rock steady job from issue to issue. Unfortunately the sudden arrival of ‘the Sentry of Death’ may herald an end to one member of the team. There are a lot of different plots running in the book right now but it’s awesome to see them finally coming together as the Uncanny Avengers move closer to reuniting and confronting the Apocalypse Twins and hopefully Kang as well. Lastly I like how much Wolverine is getting broken down in the issues because he was a character that really stagnated in recent years. I mean he basically traded places with Cyclops which didn’t make a whole lot of sense to me. Remender writes him as a man with a haunted past that has finally caught up to him giving him some much needed emotional motivation. Kudos! Ok enough about that fantastic book and onto a more somber note. 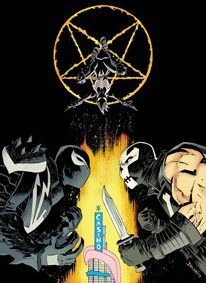 Venom: Volume 2 has ended at issue 42. I already mourned it with a 7 Part Countdown about the top story arcs; Although now I feel like I need to revise it and add the latest one in there somewhere. Cullen Bunn knocks Flash Thompson’s last solo issue out of the park bringing him full circle by pairing him with a young side kick named Mania, who he accidentally created recently. One of the biggest issues Flash has always had was coping with his alcoholic abusive father’s influence in his life. He dreaded turning into the man. Only by gaining a surrogate daughter is Flash finally able to come to peace with the fact that he is not and never will be his father. He is altogether a better man. Unfortunately I fear his end may be nigh as Dan Slott isn’t known for giving characters happy endings and Flash finds his way over into the Superior Spider-Man next month. Dun Dun Dun!!! Mania herself is set up nicely for a future story arc. She has the brand of the Devil on her soul making her one of a few people eligible to become Mephisto’s heir. She’s got to figure out how to resolve that somewhere so I’m thinking Flash should drop Mania off with his gal pal Valkyrie before taking a trip back to NY to catch up with some old friends. Who better to help her confront the devil then the Fearless Defenders after all…oh wait just heard that was cancelled too…and no a monumental NOOOOOOOOOO before continuing in solemn dismay of the world. Ok last paragraph! Thanks for reading this far! The new Captain America trailer was EPIC! It gave me everything I could possibly want. Yes the plot seems a bit obvious. 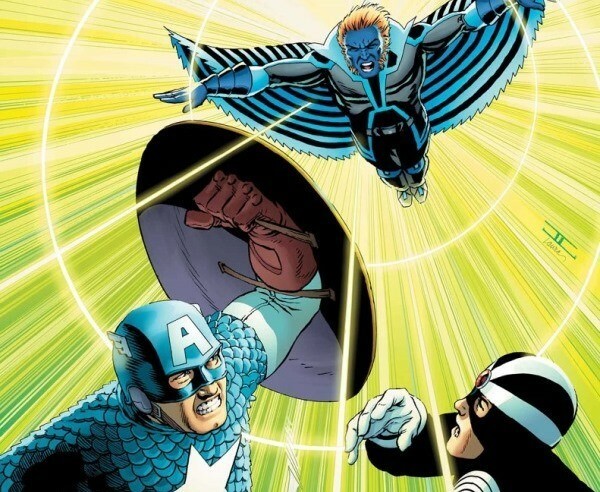 “Cap naively fights for Shield until his eyes are open to their horrible methods causing him to go rogue with Falcon and possibly Black Widow“. That said I just can’t wait to enjoy what will probably be one of the best movie rides of 2014. My only real hope is that by the end of the movie Captain America is back in the stars and stripes outfit. I mean they showed him in it during the trailer but those could be flashbacks. Then again those soldiers he fought seemed to have pretty modern guns. Oh man, Winter Soldier looks perfect and I can’t say enough about Robert Redford! I mean I was named after a character he played! (Jeremiah Johnson from..Jeremiah Johnson if you are interested in knowing.